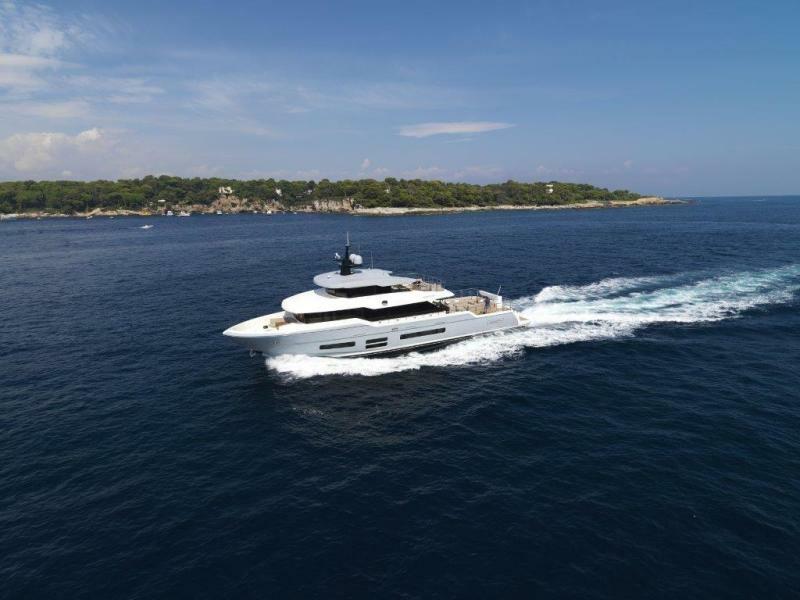 The birth of the Oceanic Yachts range by Canados is the result of intimate interactionwith customers and our constant monitoring of the global yacht marketevolution. 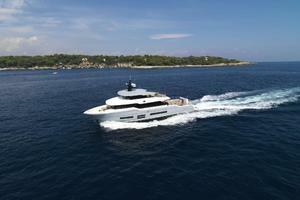 The vast majority of owners are also seeking a vessel that offers long rangecapabilities with low operating costs, but without sacrificing performances. For more information, call us today! 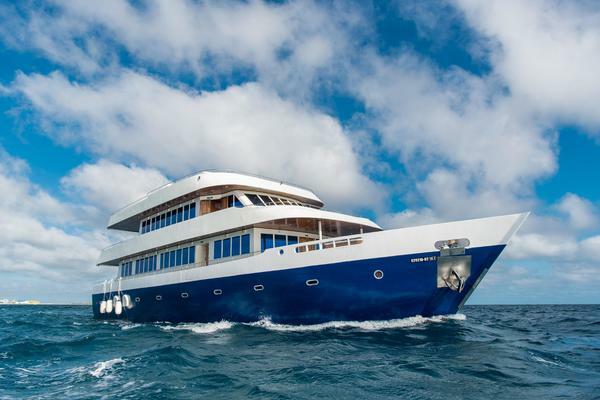 United Yacht Sales New Jersey would love to guide you through a personal showing of this 95' Canados Oceanic Tri-deck 2018. 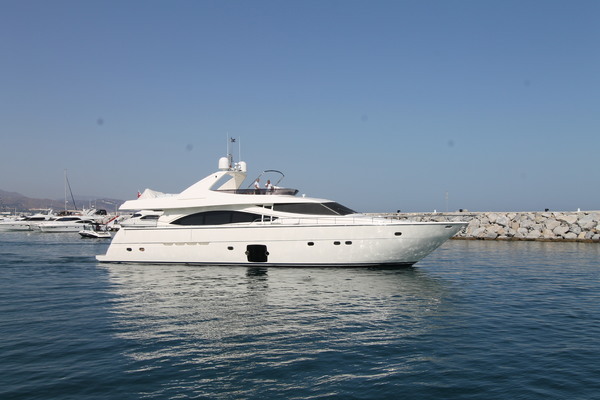 This yacht for sale is located in Dania Beach, Florida. For pricing details or a showing please contact us by filling out the form on this page and we will get back to you shortly! 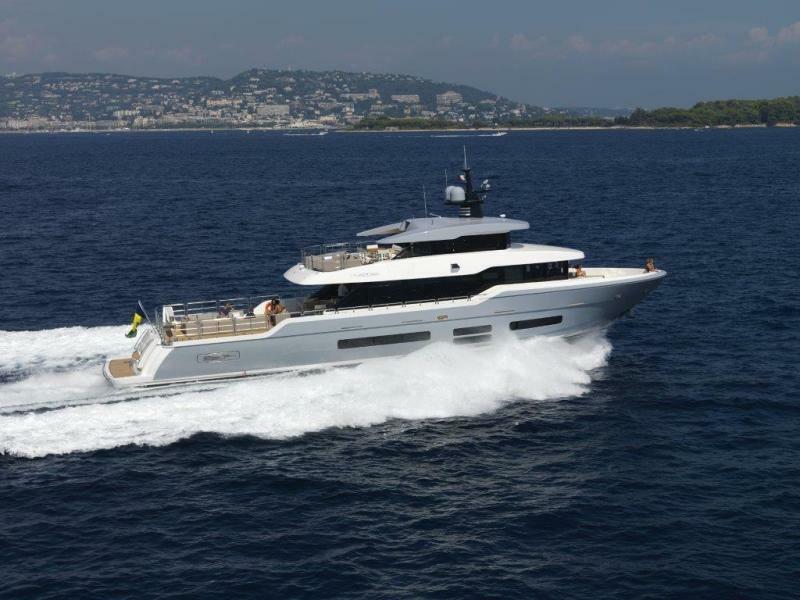 An ability to cruise in displacement mode at 8-knots, burning an astoundingly low 40-liters per hour for both engines and 75 Liters per hour at 10-knots. 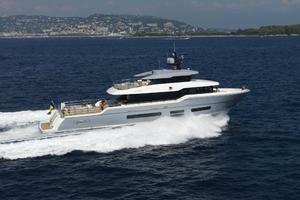 An unsurpassed ability to carry large toys and tenders including on deck in her market sector. A cruising speed of 21-22 knots in planning mode. A minimum planning speed of 16.5-knots. An athletic top speed of 26/27-knots. Over-sized entertainment spaces, unmatched by yachts that size. Luxurious and generous interior volumes. 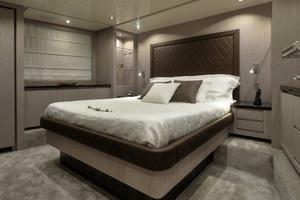 Bespoke interior layout and design tailored to client requirements. The architecture of the Oceanic range has been purposefully designed to adapt to a multiple-use philosophy. 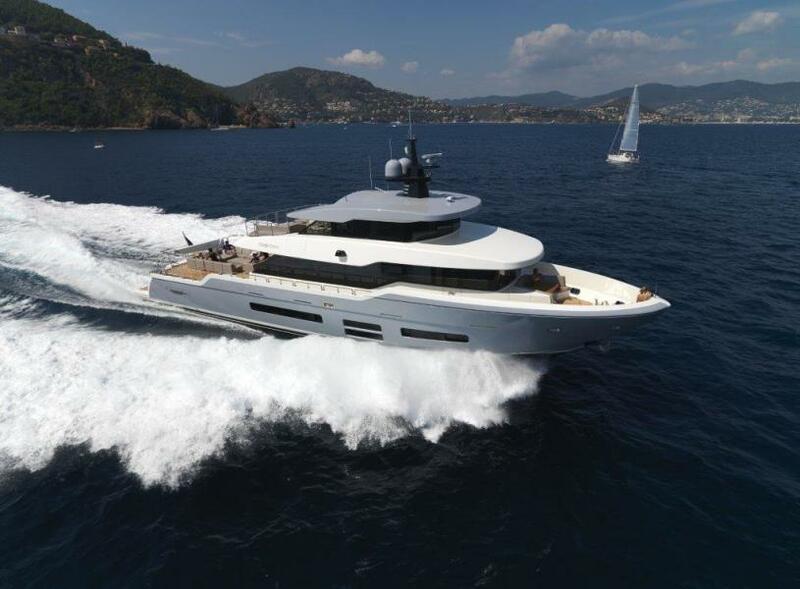 Through painstaking research and development, Oceanic Yachts has developed a revolutionary hull concept, one that allows for dramatically reduced running costs with no sacrifice of performance. 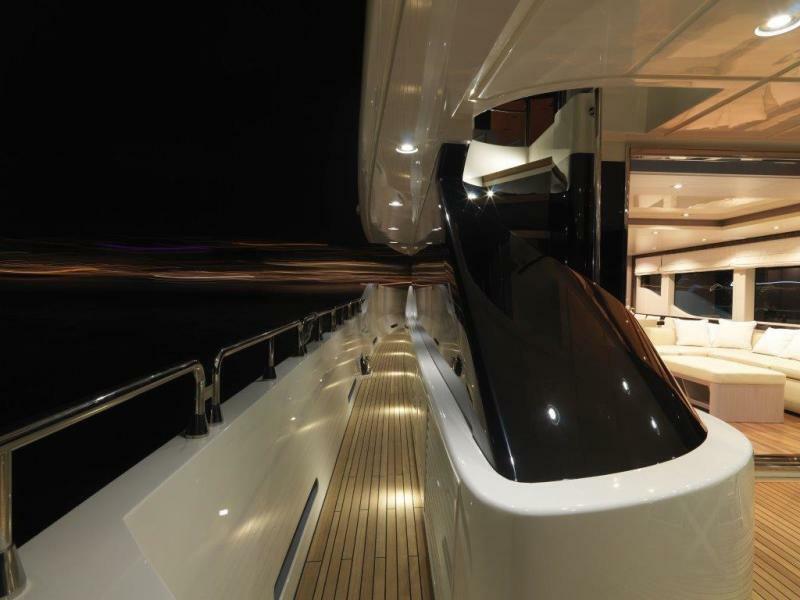 The result is the “displacing” hull design, making the Oceanic astonishingly efficient at both displacement speeds and planning speeds. Each contributor was encouraged to rethink all the fundamentals of fast hull design, implement new technologies and further develop our strong partnerships with engine and transmission manufacturers. Together we strove for not evolution, but a true revolution, something never attempted before on this size of yacht… and we achieved it! 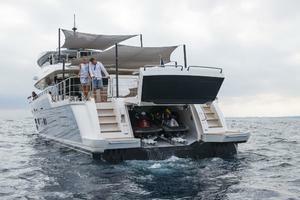 For the first time in the history of yachting the concept we term “Displacing” was created. 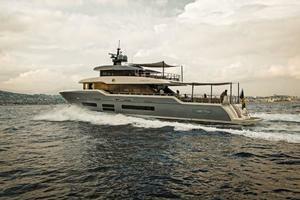 The result is a hull that allows us to reduce consumption figures other brands can only dream of. When speed is required, however, the hull’s two steps–one of which is ventilated by underwater exhausts–reduces hydrodynamic drag, meaning leading performances at planning speed with unrivaled comfort and stability. 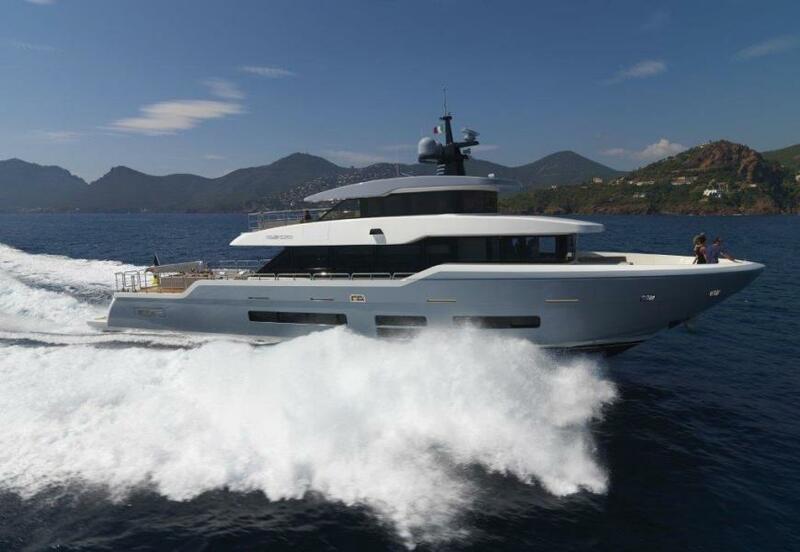 Below 16-knots the two steps reduce the buoyancy of the aft portion of the hull, resulting in a reduction of the bouncing movement experienced on other yachts at displacement speeds by up to 70%. 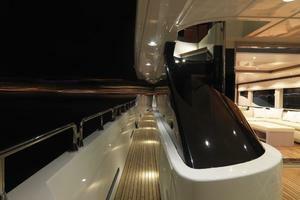 With a rear deck of nearly 60 square-meter (645 sq. 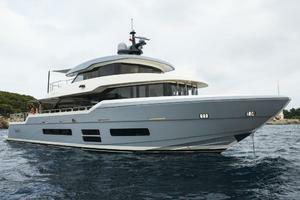 feet), the Oceanic 95’ offers larger outdoor spaces than most 40-meter (130ft) yachts. 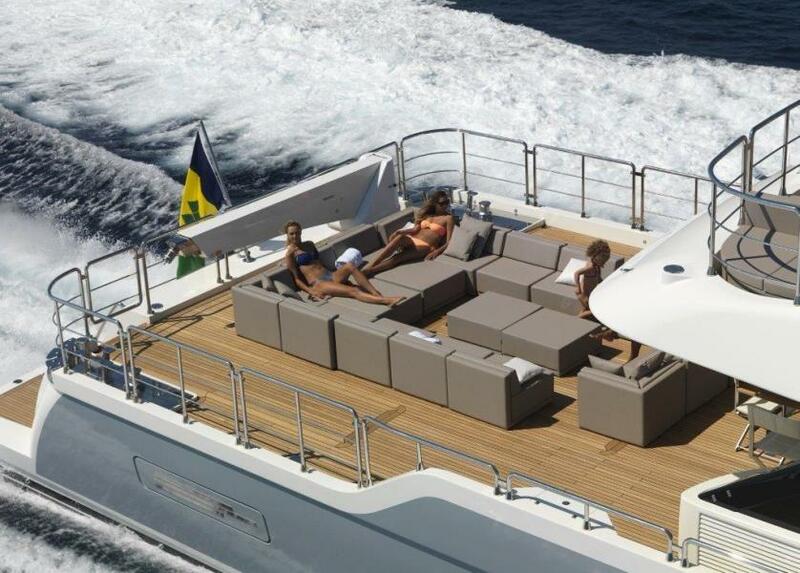 Her aft deck sofas are either fixed or entirely modular, offering multiple seating, sunbathing or partying configurations. Recognizing toy carrying capacity is a priority for some owners, the Oceanic 95’ Fast Expedition can offer not only a transom garage that can accommodate two 3-seater PWCs or a 4-meter tender, but also an on-deck crane of 1,500 kg capacity, used for the launch and retrieval of a tender up to 6-meters stowed on the aft deck. 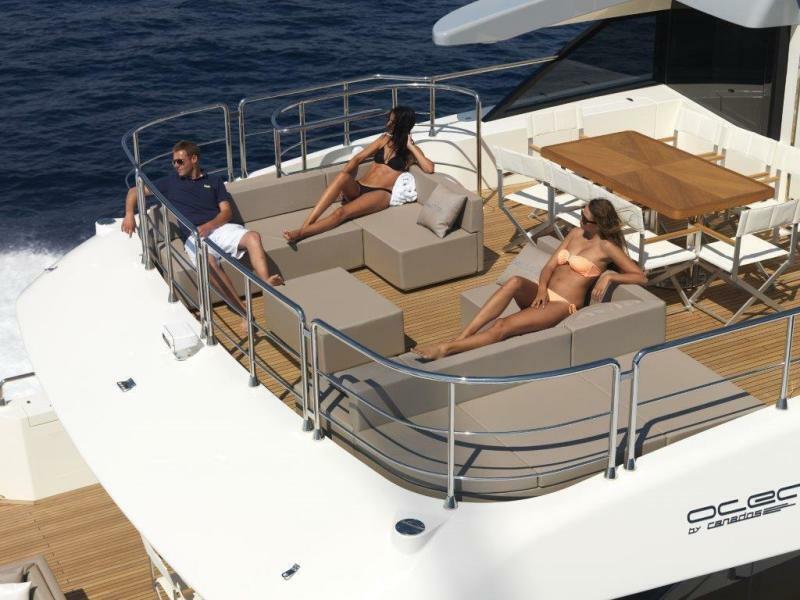 Equipped with a sun-awning system that utilizes removable poles and tensioners that can be installed in minutes, the entire aft deck offers shaded respite from the sun when required. 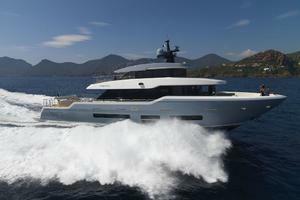 The system can remain in position even when the yacht is running at speeds of 20-knots! 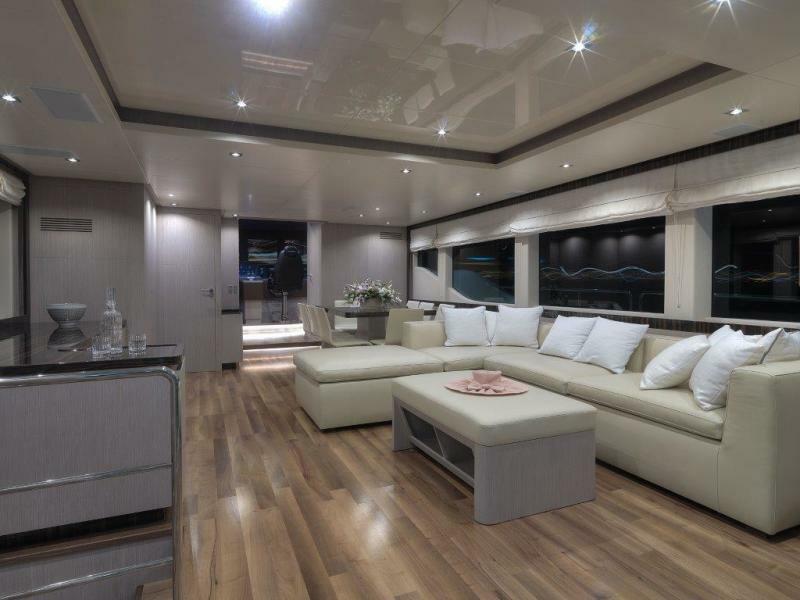 Designed to afford breathtaking ocean panoramas from wherever you are on board, the Oceanic 95 breathes fresh life into your yachting experience…whichever layout you choose. 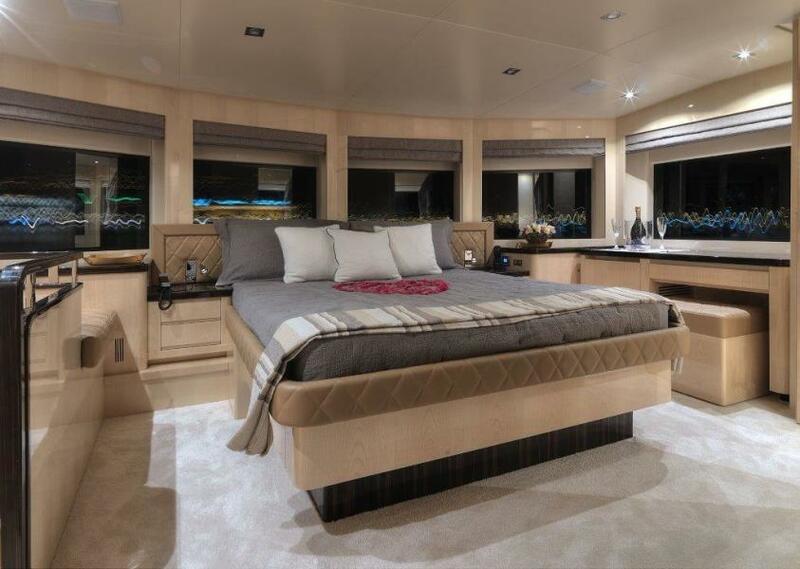 Available with a top deck wheelhouse and on-deck master suite, or–like the model featured in this brochure–with a top deck owner’s, the upper deck terrace provides additional external outdoor living area. 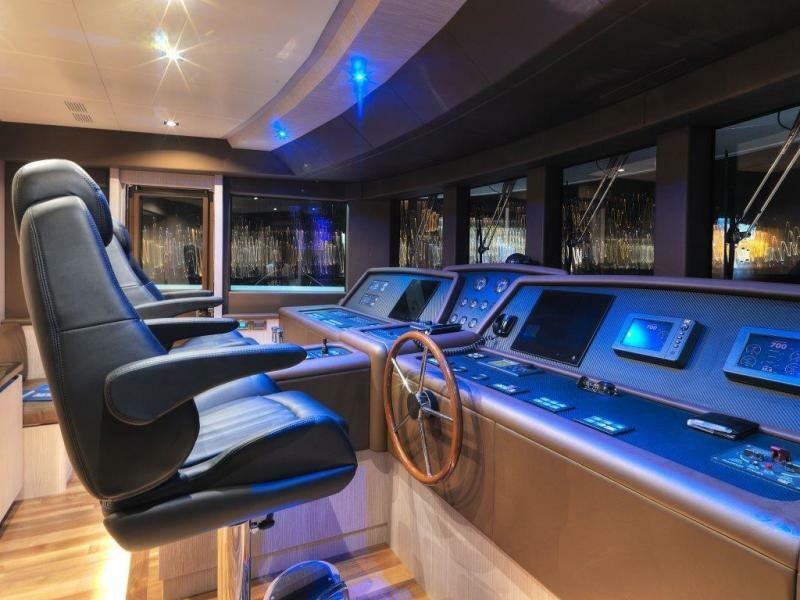 Access to the fore deck is well protected by high bulwarks, making movement forward to enjoy the comfortable lounge in the bow stress-free, even underway. 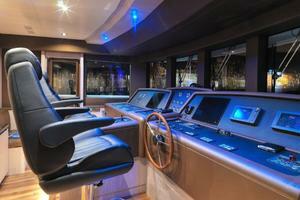 Crew and passenger access to the bow area can also be gained via two panto-graphic doors in the wheelhouse. 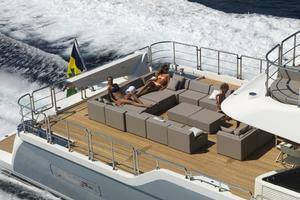 The fore deck dinette also converts in a sun bathing area. 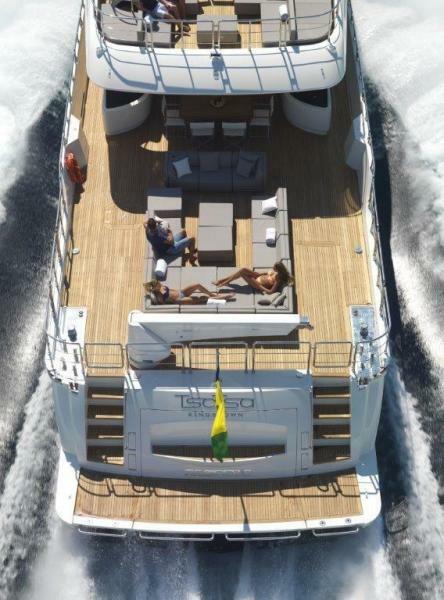 Each Oceanic yacht is truly unique. Being entirely bespoke, the interior design will be created, by world famous Venice based Cristiano Gatto Design Studio; a service included in our «specification», or by a designer of the owner’s choosing. Thus, each Oceanic reflects the aspirations of its owners. 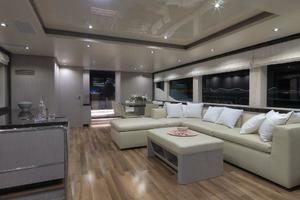 Down to the smallest detail, each interior is customized especially for your yacht. You choose the wood species, mood board and styling. There are 3 different interior designs available to choose from; Modern, Contemporary, and Old Navy. The passion we pour into the technical excellence of every Oceanic produced can only be achieved through the implementation of traditional craftsmanship. 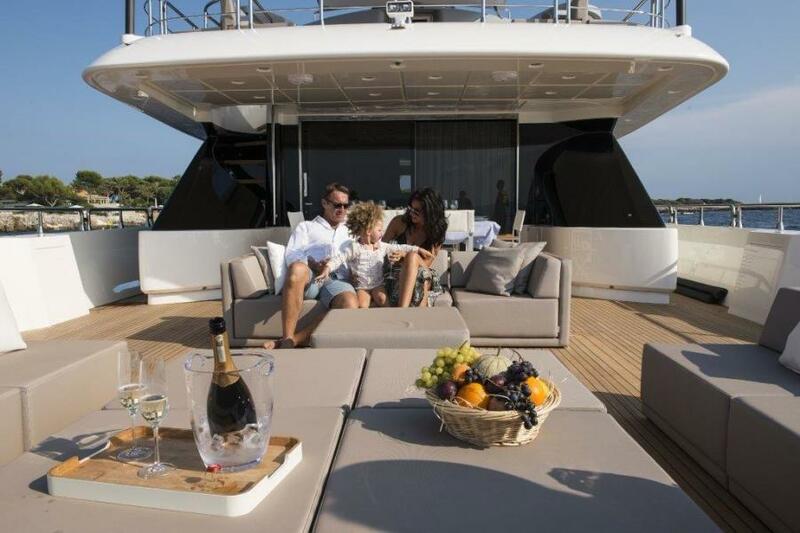 At Oceanic, our mission is not to build a yacht for you… but to build it with you. 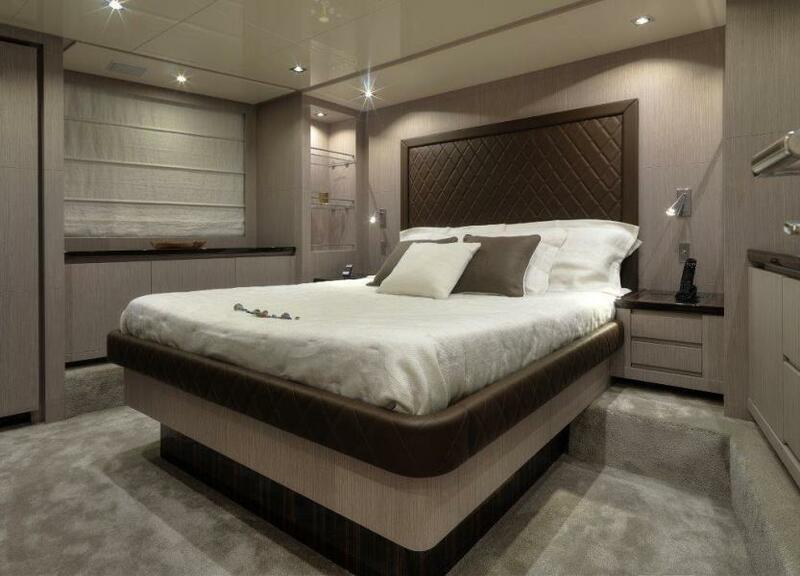 Whether you choose a three, four or five stateroom version, an Oceanic 95’ always addresses the requirements of its owner. 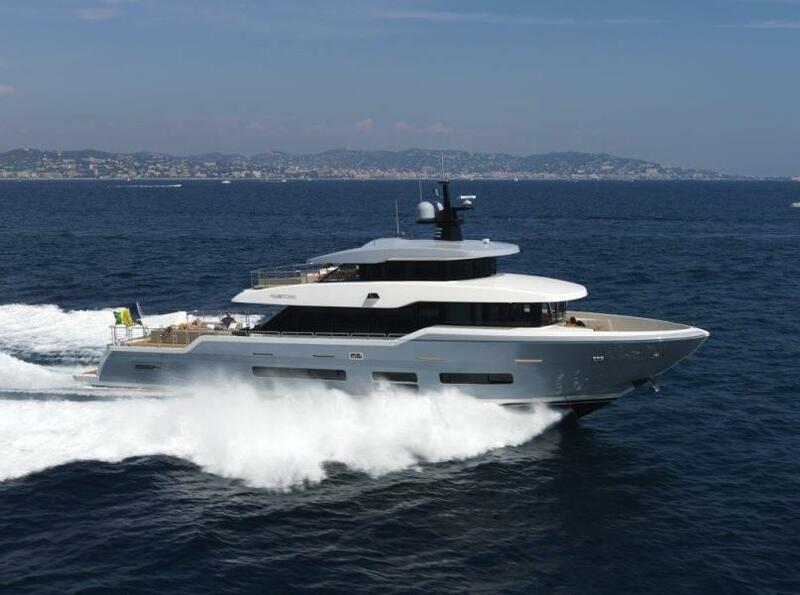 The reduction of operational, maintenance and running costs remains a principal of primary importance with an Oceanic Yacht, while the desire to maintain rapid acceleration and fast speeds remain a priority. 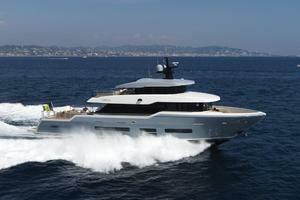 This apparently conflicting mandate has led to the solution of building our yachts in advanced composite materials. The method of construction and technology employed is admittedly more expensive than aluminum or steel, but this is far outweighed by its lightweight properties, resistance, and durability. Composite eliminates 100% of the corrosion issues and reduces by 80% electrolysis related problems, all while offering impact resistance two to three times greater than that of steel and aluminum. 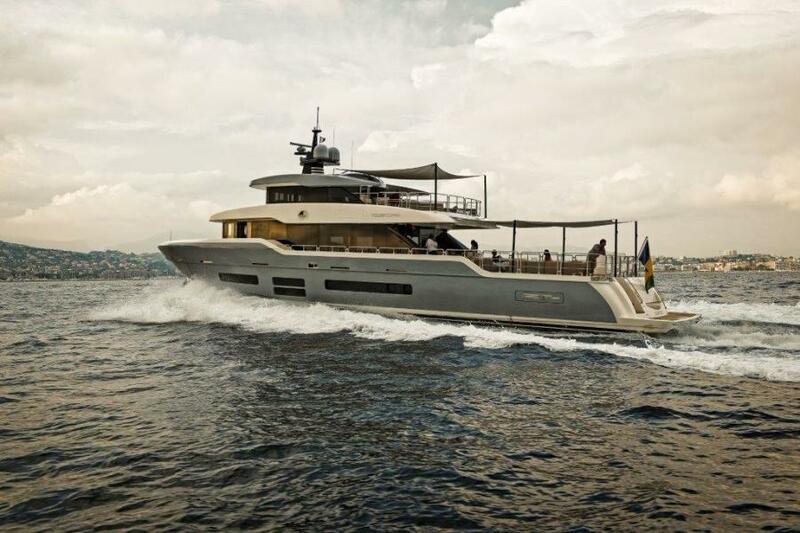 While hull and deck are made of GRP, the entire superstructure is made of lightweight Kevlar/Armat which allows lowering the center of gravity. 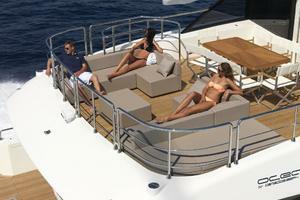 The incredibly versatile Oceanic 95’ is available in multiple different interior layout versions. Recommended engine packages include twin Caterpillar C32 Acert, twin MTU or twin MAN installations. These can be coupled to conventional propeller shafts, to V-Drives or pod propulsion.